What a difference six months makes in the growing season. My clients’ courtyard garden was planted up in May this year, and as the gallery photographs show it has absolutely flourished. I designed a simple planting plan for my clients who wanted an easy to maintain garden but elegant and beautiful. The planting plan was lovely to put together and I included scented roses, box cubes and globes and late summer stunners to eek out the charm within the garden. I placed a mirror on the garden wall which has really come into its own now as the Clematis grows and frames it adding even more charm and beauty. A really lovely courtyard garden brought to its full potential. 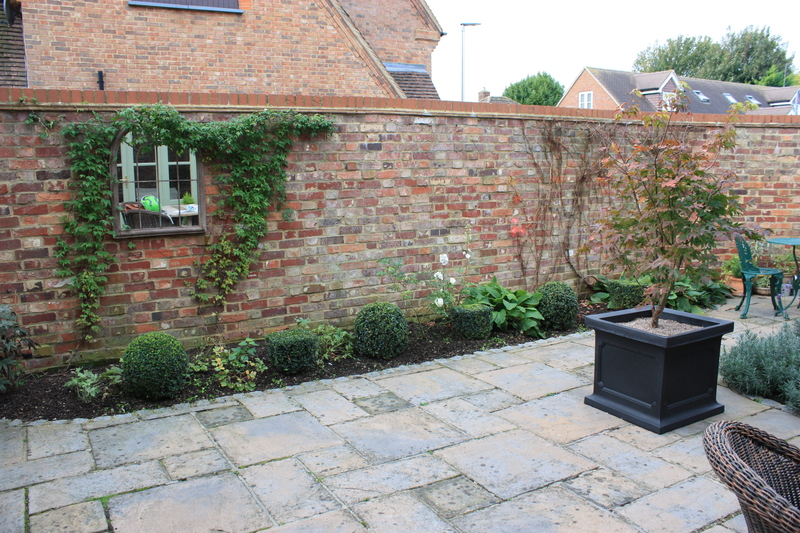 A feature Acer was planted in a huge black square planter which brings a little drama and formality into the space. As the autumn season develops so do the colours as the leaf colour deepens before falling. My thanks to Sue and Clive for trusting me with their precious space. If you would like to rethink the planting in your garden do get in touch! NextStevenage new build garden, one year on.. 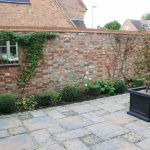 Perfect planting for a cosy courtyard, and it will be even better in years to come. Lovely! Thank you Simon for your feedback. Clients are very happy with their transformed garden.